Hot Shots: Part Deux parodies the two Rambo sequels, but mostly focuses on this one since there’s such a massive amount of material to draw from. What’s amazing about that film is that hardly any of it is changed from what is actually in First Blood Part II. It simply recreates most of the action with different actors. Even Weird Al Yankovic took a stab at this one in his only feature film, UHF. The truth doesn’t need to be stretched. The “popcorn movie” is a tradition in Hollywood. These are the movies that lack any sort of logic, plot, or believable acting, but are so much fun you find yourself enjoying them anyway. It could be argued that Rambo II: First Blood is the original. You’ll never see another movie with such a low level of logic produced again anytime soon. Then again, who cares? It’s fun. There are so many moments in First Blood Part II where your jaw will drop; you couldn’t possibly believe what you’re seeing. Where the original had some substance and merit, this one throws all of that away to create the quintessential dumb action movie. Countless scenes feature Rambo against five or more enemies who fire a ridiculous amount of ammunition at the hero only to be wiped out with one sweep of Rambo’s weaponry. For trained soldiers, these guys need some help. The final helicopter fight is even better (worse?). Richard Crenna does a better job here than he did in the original film, but Julia Nickson is just flat out terrible. Her broken English act (she is supposedly a Vietnamese) is so forced and obvious, not a single line she speaks can be taken seriously. The romance between her and Rambo, which is supposed to develop throughout the film, just comes off as another cheesy element to a film that seems like it was made for a child. It also marks the only kiss in the franchise. Crenna’s character, the venerable Col. Trautman, tries to bring something to the table to give this madness meaning. His feud with Charles Napier delivers some powerful lines as they pertain to P.O.W.s in Vietnam. Sadly, when the action kicks in, all is forgotten. The original Rambo delivered its message about the after effects of the war. Part II is just about war. What makes no sense is that by the time the film is over, you’ll see that you have been cheering for the guy and have had a great time all the way through. The adrenaline rush this film provides is just awesome and no matter how hard you may be laughing, you have to admit you’re having a blast. This isn’t trying to be the original, it’s simply trying to entertain. 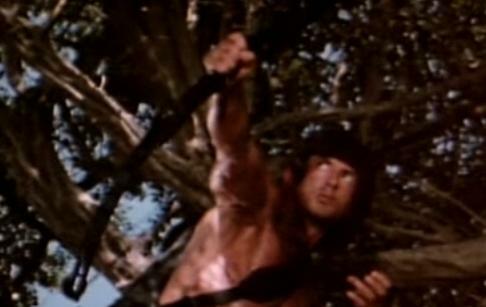 Rambo II is a surprising Blu-ray effort. It’s relatively crisp and detailed. Close ups reveal incredible levels of facial detail. The transfers issue is one of stability. The sharpness has trouble maintaining itself, and the richness of the black levels varies from scene to scene. A slight hint of edge enhancement can be seen, along with minor compression artifacting in the reds. Given the age, the print is in remarkable shape, and this looks far more modern than it really is. Flat is the only way to describe this lackluster audio performance. There is nothing to discuss as far the surround channels are concerned. Explosions are devoid of any bass. Dialogue comes off faded, and the soundtrack can be hard to make out under the action. The extras here are slim. A nice trivia track pops up during the film if you wish, keeping a body count and delivering nifty facts as the movie goes on. The sound effects it uses are distracting though. We Get to Win This Time is a 20 minute retrospective piece that discusses the controversial politics in the script, story development, and casting.